Last month a friend booked us both on a jewellery workshop with Stones of Isis in South London. She’d seen a Groupon offer for a beginners class for 3 hours at £22 each, it’s very good value and if that deal is still available I’d recommend you book if you can. 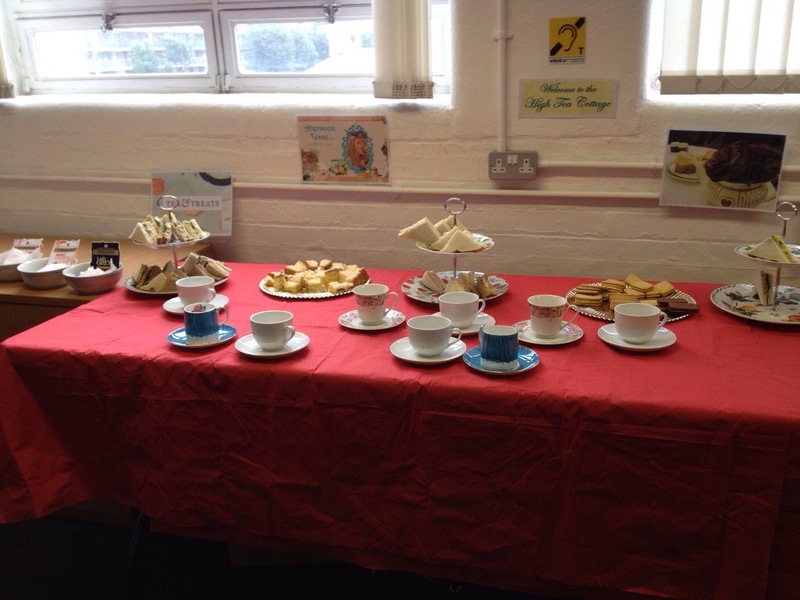 We went to The Old Biscuit Factory in Bermondsey (spell check wants to change this to ‘spider monkey’ ha ha!) on Saturday. Gok Wan uses a studio there to photograph his collections apparently – there’s a random fact for you. I’ve never made any jewellery before, unless threading painted pasta on string counts? You can see how my attempts improved, though there’s still a long way to go. So, in a nutshell this is what the equipment’s called and how you make a rosary bracelet Oops, I realise I can’t name the equipment with confidence at all! I need to check the pdf that’s promised to all who attended the workshop. This is the work of the graphic designer who sat opposite, we both loved her colour choices, repeating pattern and neat work. 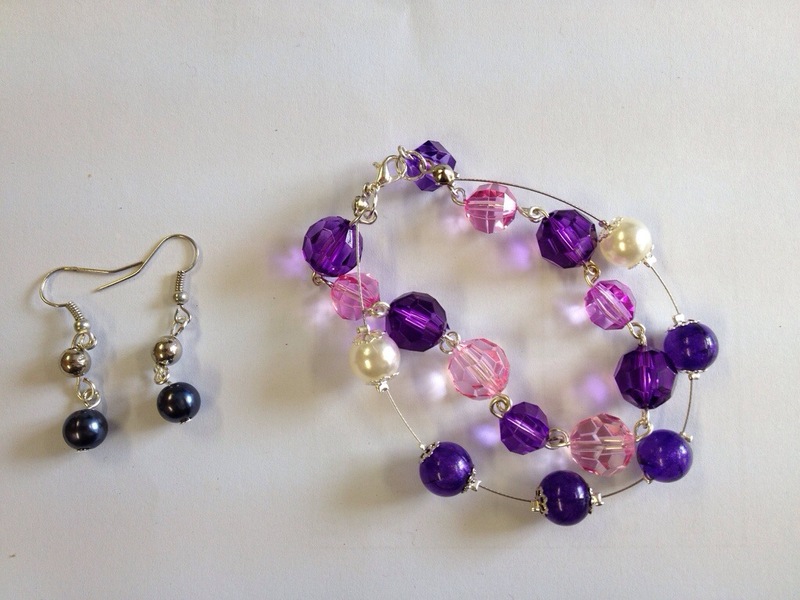 She insisted she’s never made any jewellery before and we veered between envy at her talent and thinking she couldn’t be new to it at all because it looks so good. 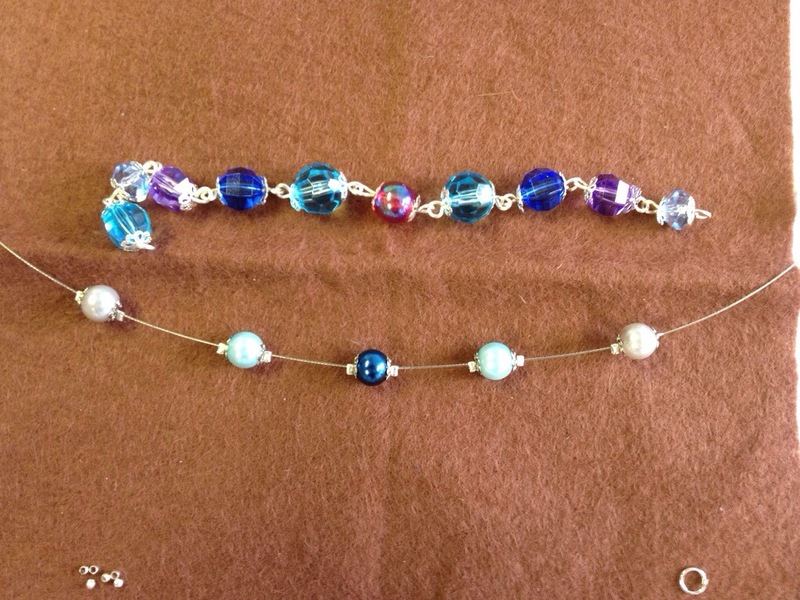 Her pearlyish beads on the floating bracelet inspired me to add two to the end of mine. Sandwiches, tea, biscuits and cake were provided but to be honest I think we were mostly all too busy to stop and eat much. Here are my finished items. As Bola and Mary, the teachers and owners, said you can spend a fortune in Accessorize on similar bracelets. I don’t wear necklaces but have a huge bowl of bracelets so making my own really appeals but I’ll probably need to arrange a follow-up crafting session with my friend Sarah who creates the most lovely jewellery, for a bit of a refresher. Next we crossed the river and went to north London to Islington. 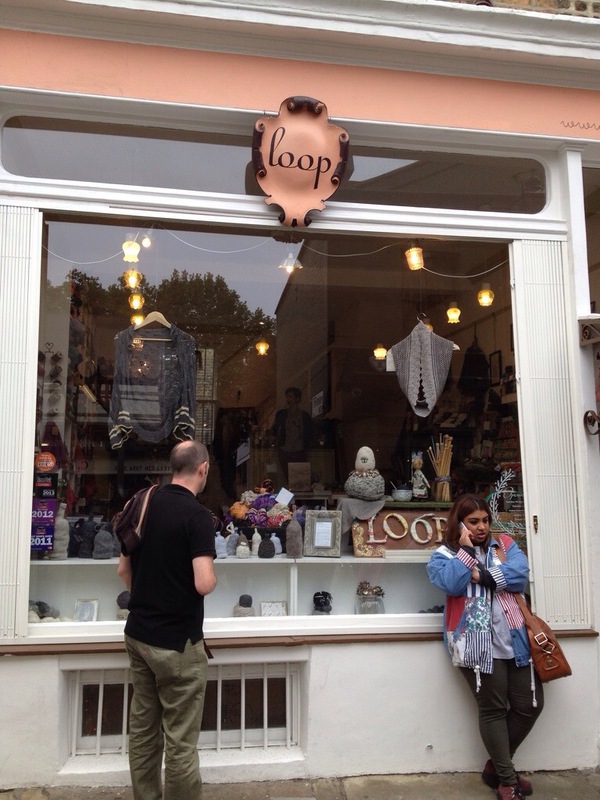 There’s no way you can really go there without a little visit to Loop. After my recent thoughts about Noro wool feeling too scratchy we discovered they make an absolutely gorgeous variegated cotton. 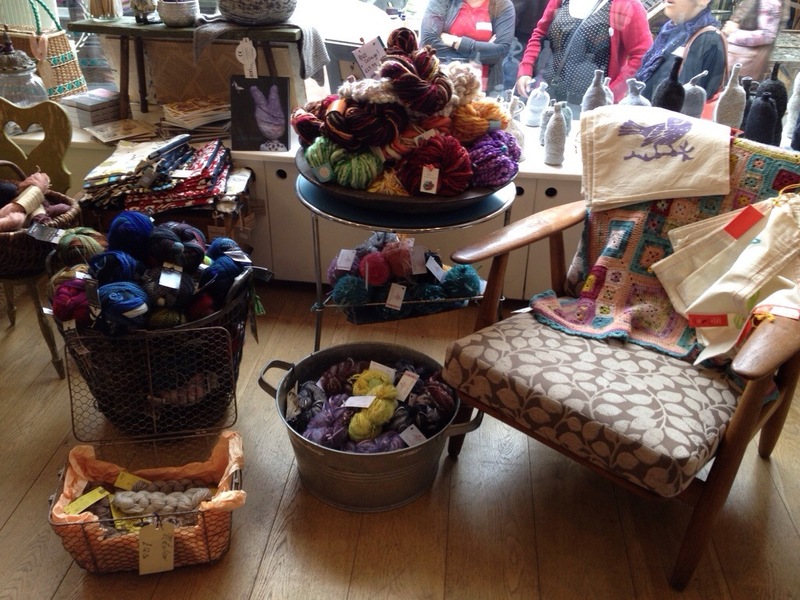 I was soooo tempted to buy some but first need to finish my Rowan and Planet Penny cotton. I have a giftcard to spend at John Lewis sometime, plus I’m busy using my Black Sheep Wools haul so didn’t buy anything. 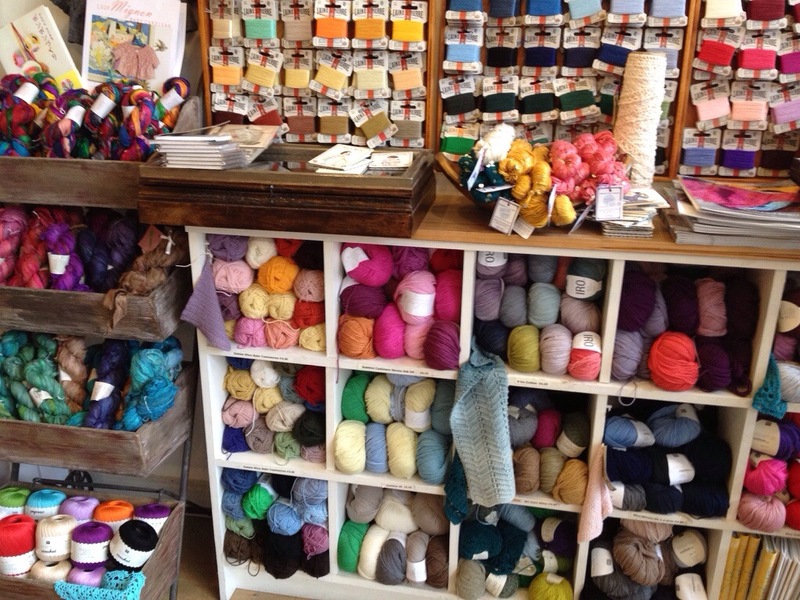 It was hard not to buy a ball of each colour combo of that Noro cotton, but I stuffed my hands in my pockets. 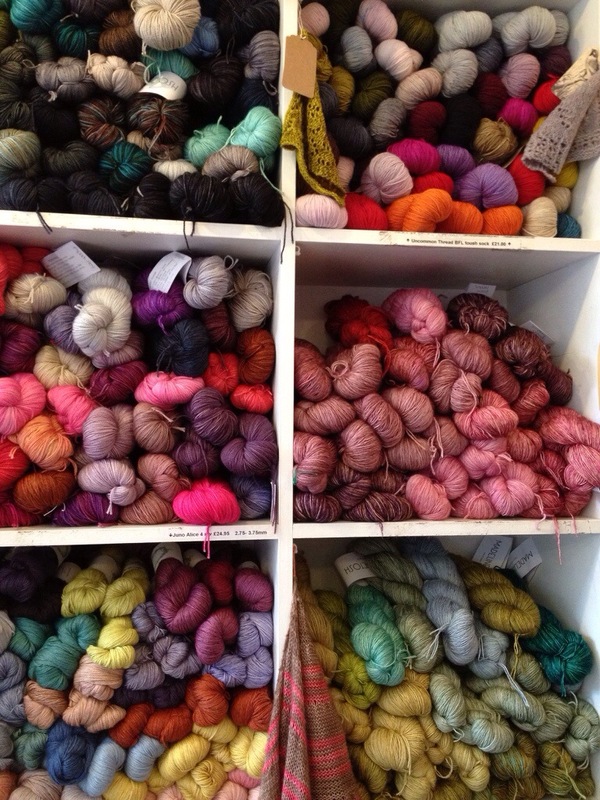 Lush yarn isn’t it? I believe you can just tell looking at these photos. Some is £20 and upwards for a skein, so I’d definitely need to feel more confident about my knitting before I bought enough for a garment. 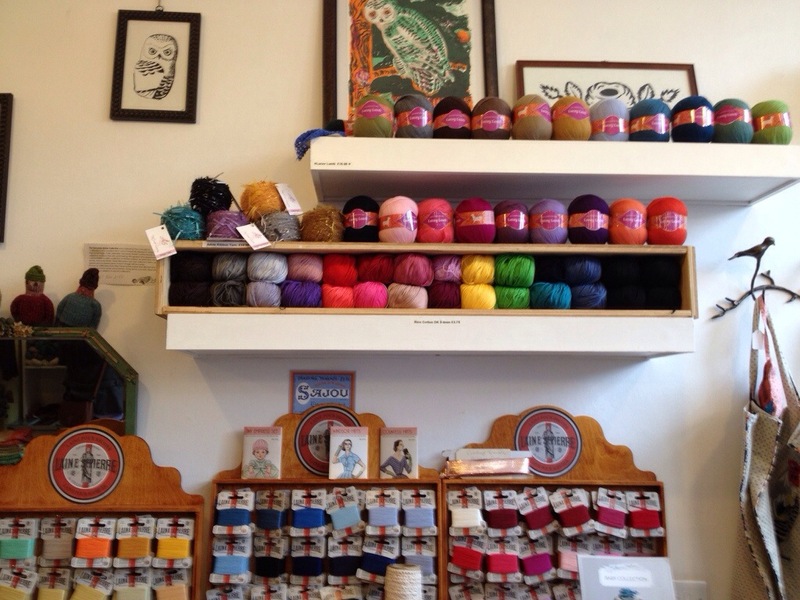 Seeing stacks of beautiful yarn is really like heroin for crocheters and knitters isn’t it? OR, is that just me?! Perfect analogy, I’m a totally addicted to yarn. I’m coming over to London soon and planning to visit Loop so now seeing your photos, oh la la I can’t get there quickly enough. It’s not just you :) – I love Loop! heroin, coke, nicotine, alcohol, the whole bang shoot. 22 quid a ball? Holy crapoly, I could get half a tank of petrol with that!!! Some only start at £20, many are more! No, Rachel, it’s not just you!!! I think a large part of crafting is stash collecting, as well as actually crafting. I have interests in quite a few crafts, and have done so all my life. Knitting, embroidery and dressmaking were my earliest, from being too young to remember actually learning the first two, and now I’m 51, and have masses of stash for all 3 crafts! LOL! Sadly, I don’t have anything like you saw in ‘Loop’ – I was virtually salivating just looking at the photos you posted!!! LOL!!! I very much enjoyed looking at your jewellery pieces . . . you did really well, especially for your very first experience! 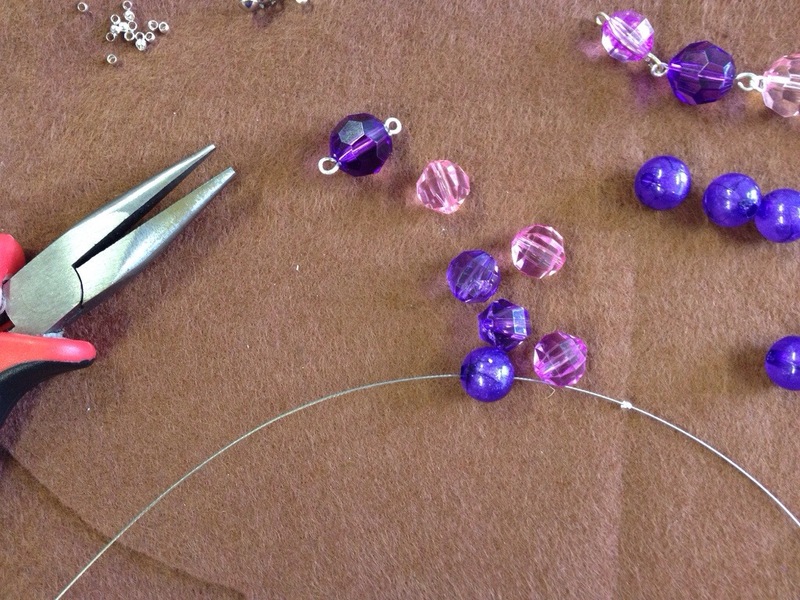 Jewellery making is a craft I had wanted to do since I was 15 years old and found myself in an incredible bead shop on a school trip to London (I live in north west England), but I didn’t get to try it until my daughter grew up and left home about 6 years ago. I turned her bedroom into a craft room, and would lose myself in there with beads spread out on my large workdesk sitting in Pringles tube lids (they’re great as they don’t take up much room and you can bend them to funnel the beads back into the bags when you’re done with them), and quite often, before I knew it, I would be watching the sun come up! Unfortunately, my health isn’t so good now, and I’m mostly bed bound. I have an overbed table on which I can still do a little bead work, but I can’t sit for long, and I’ve lost most of the sensation in my fingers, which makes any crafting “interesting”, shall we say, but still possible (longer fingernails make it possible to pick up small objects like beads, and pills etc! LOL!). Dressmaking has been the biggest casualty, but I’m thinking more of patchwork/quilting with much of my stash, if I can figure out a way to use my sewing machine on my overbed table (I can’t feel my feet to operate the machines pedal, either!)! LOL! I guess my message to everyone is to never put off something you really want to do, because we never know what the future holds for us. I qualified as an occupational therapist when I was 21 years old, but a car accident cut my career short at just 25, but it’s the health issues that have come to light in the last 5 years that have really slowed me down, or should I say, all but stopped me. What I learned as an ocupational therapist probably helps me to adapt a great deal, but there’s only so much you can do, especially when your income is about as low as it can get. 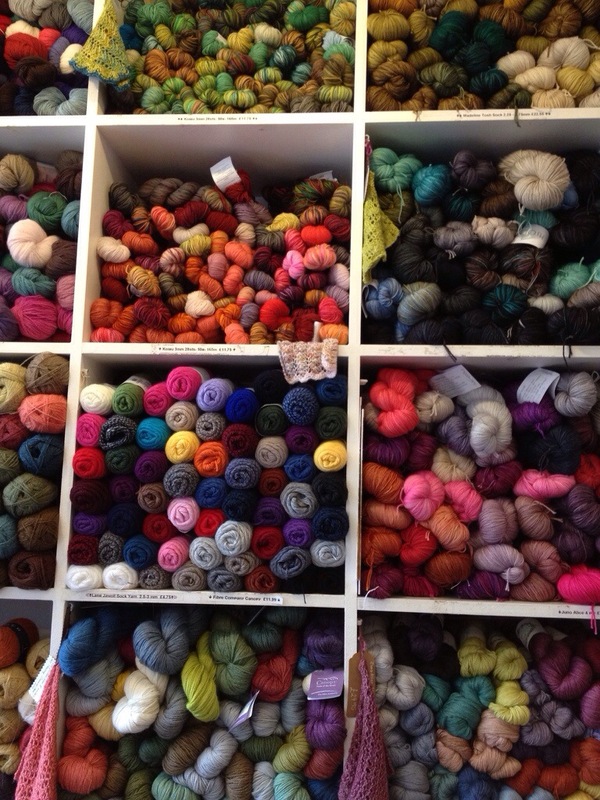 If you can afford that expensive and luscious yarn you were drooling over, get it and use it. You can’t take your money with you, and one day, you might have the time and inclination to use it, but not the money to buy it. Don’t put things off. 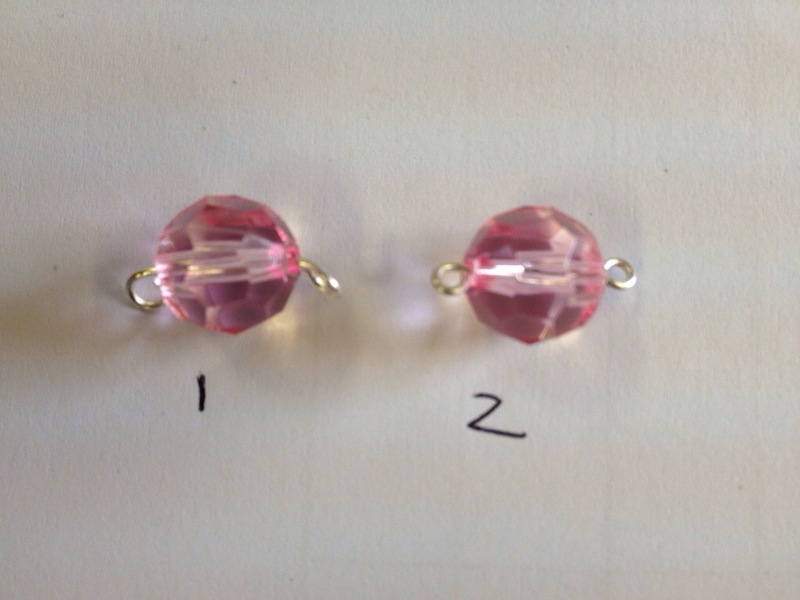 Reading blogs like yours, and other crafters, gives me real enjoyment during the times when I’m not well enough to actually craft for myself, and sharing your first experience of jewellery making brought back a lot of happy memories for me. I don’t often comment, but I’m usually here reading. Thank you.